A Lightning Protection System (LPS) is designed to protect a structure or building and contents from damage caused by the intensely high voltage currents of a lightning strike (often exceeding a 1,000,000,000 Volt Amps). Lightning protection systems act like a Faraday Cage for buildings. Protecting the building and its contents from external electric fields by migrating that energy around the cage instead of through its contents. A lightning protection system offers a lightning strike a low resistance path to ground where the enormous energy is then safely dispersed. A typical lightning protection system includes lightning rods, metal conductors and ground electrodes designed to offer a low resistance path to ground and to take any high voltage currents from a lightning strike away from the structure of the building. NSE(Wales)LTD can offer an installation, maintenance and annual testing of lightning protection systems to BSEN 62305. The recommended test frequency for lightning protection is every 11 months. Generators and wind turbines need dedicated low resistance paths to earth similar to Lightning protection systems. 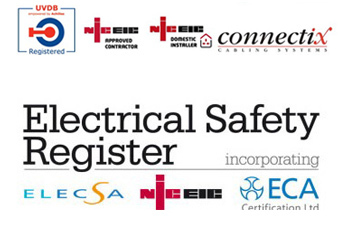 NSE(Wales)LTD can offer the installation of earthing rod/earth mat distribution systems to BS 7430. The recommended test frequency for earthing systems is every 11 months.